With perfect weather, rich history, local culture and an international flavor, it doesn’t get much closer to expat heaven than Chania, Greece. Chania is the second largest city on Crete, which is the largest of the Greek islands. In recent years, the island has become a top destination for EU expatriates who can purchase property here with little formality. Real estate companies in Chania tend to cater to British expats, although Scandinavian and German settlers have also nudged in, breathing new life into this ancient harbor city. It’s hard to blame them. 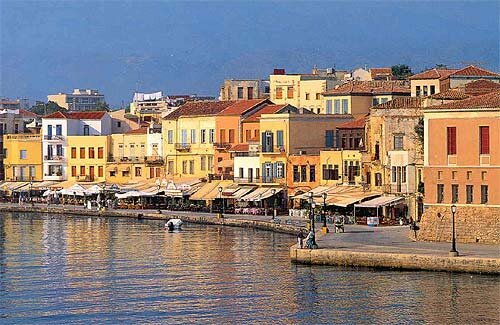 Chania has a balanced, pleasant and quiet population of just about 60-70,000. Of course, it doesn’t take much convincing to sell the notion of living among the Greek islands. The Mediterranean climate makes clear-sky weather an almost everyday feature here, and the air is always warm but never too hot due to the cool Etesian winds which moderate the temperature. Historically, the island was the center of Minoan civilization, which was the oldest Greek civilization. It is Crete which is the origin of so many classic Greek myths and legendary characters, such as King Minos, Theseus, Daedalus, Icarus, and even the chimerical Minotaur. Though unlike the symbolic legend, modern Crete is definitely one labryinth worth getting lost in. After the Minoans, the island has passed hands between the likes of the Romans, Byzantines, Iberians, Venetians and the Ottoman Empire. The island has a touch of nearly every great civilization to have come through the Mediterranean. You might say that it’s been an expat utopia for millennia. Due to that colored past, fans of historical museums won’t be disappointed in Chania. And definitely take the time to visit the city’s old town, which is easily one of the most beautiful urban districts in the whole of Greece. If you’re looking to escape to Chania (and why wouldn’t you? ), a great resource for expats in Crete can be found at expatcrete.com, hosted by Expat Focus. And a good primary resource for British expats in Chania can be found at Brits in Crete.